Cancer death rates in the United States continue to drop for all cancers combined as well as for most cancer types, finds a new government report that examined data between 2003 and 2012. While overall positive, the report findings also emphasize the large number of new cancer cases that can be prevented and examines the troubling rise of liver cancers. The findings are from the “Annual Report to the Nation on the Status of Cancer,” a report by the Centers for Disease Control and Prevention, the North American Association of Central Cancer Registries, the National Cancer Institute, and the American Cancer Society. For new cancer cases, rates decreased slightly during this time among men, while remaining stable for women. Prevention measures, early detection and improved treatment have all played a role in these overall positive findings, says the report. Continued focus on primary prevention efforts to reduce or eradicate risk factors before cancer occurs is critical, the report concludes. Many modifiable cancer risk factors contribute to many types of cancers, including tobacco use, excess alcohol consumption, poor diet, excess body weight, and physical inactivity. Reductions in these unhealthy behaviors and improvements in healthy lifestyles over time can reduce the burden of cancer, the authors write. AICR research estimates that almost one in three cases of the most common cancers can be prevented by adopting a healthy diet, participating in regular physical activity, and maintaining a healthy weight. Add in not smoking and other preventive measures and the numbers increase to approximately half. Every year the report examines one cancer trend in depth and this year it is liver cancer. The findings on longer survival overall are in contrast to the death rates from this cancer. Death rates due to liver cancer have increased the most compared with all cancer sites, and liver cancer incidence rates have also increased sharply. Men seem to bear the brunt of liver cancer incidence and death. In 2012, men had nearly three times the incidence rate compared to women and twice the rate of death. From 2008 to 2012, liver cancer incidence increased an average of 2.3 percent per year overall, and the liver cancer-related death rate increased for both men and women. In all racial and ethnic populations, about twice as many men as women were diagnosed with liver cancer. Between 2008 and 2012, liver cancer incidence rates were highest among non-Hispanic American Indian/Alaska Native men followed by non-Hispanic Asian/Pacific Islander men. Hepatitis C and liver cancer-associated death rates were highest among those born between 1945-1965; these also represent the majority of Americans with hepatitis C infection. 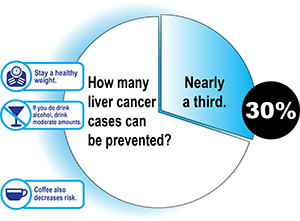 Most cases of liver cancer are preventable, according to the report. Hepatitis C is a major contributor to liver cancer as is hepatitis B, obesity, and type 2 diabetes. For hepatitis, the recommendations to reduce cancer risk are early detection, treatment of hepatitis C and using vaccines to prevent hepatitis B. Promoting healthy eating and physical activity were also named as preventive measures in the report. Obesity and type 2 diabetes can cause cirrhosis, which can progress to liver cancer. Excessive alcohol use is also associated with cirrhosis and the CDC estimates that 8-16% of liver cancer deaths are related to heavy alcohol use. When focusing on diet, nutrition and physical activity with liver cancer risk, AICR/WCRF’s 2015 report also found that excess body fat and alcohol increase the risk of this cancer. The report concluded that drinking an average of one cup of coffee daily reduces the risk. AICR estimates that if all Americans were a healthy weight, an estimated 30 percent of liver cancer cases could be prevented annually. Obesity is now recognized as a major cause of 10 common cancers; the link between diabetes and cancer is also well established. Research shows that people with diabetes have a two and a half fold increase in risk of liver cancer. In addition to sharing common risk factors, both obesity and diabetes seem to increase cancer risk related to insulin resistance and a pro-inflammatory bodily environment that may encourage the cancer process. The Annual Report to the Nation was supported by the Centers for Disease Control and Prevention, the National Cancer Institute, the American Cancer Society, and the North American Association of Central Cancer Registries. Ryerson AB, et al. Annual report to the nation on the status of cancer, 1975–2012, featuring the increasing incidence of liver cancer. March 2016. Cancer. AICR/ WCRF Continuous Update Project Report: Diet, Nutrition, Physical Activity and Liver Cancer. March 2015.